In software development you start with a blank slate from which anything that can be imagined can be created. On this site you will find a small set of the applications I have taken the time to create for anyone to use. Applications are designed with the goal of presenting information in an intuitive manner. Each application is built specifically for the platform it is made available. This means more time is required but it allows me to tune the application so it can fully take advantage of features in the mobile environment. Honestly, this is why I develop, I find it fun. I enjoy putting my name behind my code and creating applications with substance to them. 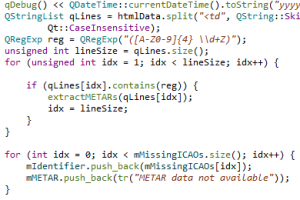 Version 2.2 of Weather Pilot has been released fixing the METAR and TAF download issue. Update 26 Feb: Still no word from BlackBerry support on whether they have recieved my ticket. Sorry for this downtime. I want to apoligize for users of the BlackBerry 10 version of Weather Pilot. I have a release to fix the issues with the METAR and TAF data not loading but am unable to submit the build through App World due to technical difficulties. I have contacted support and am waiting on their response. Updated the Android version of Weather Pilot to use HTTPS for data retrieval. In the near future this will be required for the app to work as HTTP connections will not be permitted. Please update at the next opportunity. The weather services are all operational again for all countries. 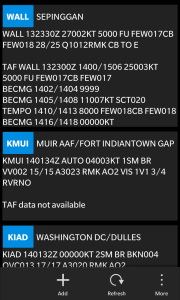 Weather Pilot version 2.5 has been release for Android 4.4 and newer. The release adds several new features. Option for users to make a one-time purchase to remove all advertisements. Tutorial that launches the first time the application is run. Change Log so users can view the history of changes. Menu option to email the developer with all recorded problems from the current session. I will be working on updating the application for pre-4.4 Android versions shortly. Update: Pre-4.4 application released in the Play Store. I’ve released the project I created to parse station details from aviationweather.gov to github. The library is written in C# .NET version 4.5.2. It should be easy to port it over to an earlier version of .NET or even .NET Core if needed. Feel free to take a look and make some pull requests if you have bug fixes or new features. Any new feature must have Unit tests defined to validate functionality. As I make updates I’ll post them to the github site for anyone to use.